When Johnnie Water was a schoolboy, he and his classmates were required to go to the river every morning to fetch at least two buckets of water to help fill the school's tank. At the house where Johnnie Water lives now in Accra, Ghana's capital, the water is plentiful, but every ounce of it is trucked in by a private company at great expense. Like most of his fellow Ghanaians, Johnnie has been chasing after water his whole life. "There are very few businesses in Ghana where you won't be swindled," he says. The number of people in the world who have access to an "improved water source" - one not contaminated by faecal matter - has increased by more than two billion since 1990, a 2012 WHO report shows. In Ghana alone, about 3 500 children under five years old die each year from waterborne illnesses brought on by contaminated drinking water and poor sanitation, the United Nations Children's Fund says. Despite an abundance of water sources, most people in Ghana can't simply turn on a tap to get it. Instead, millions get their water in 500ml plastic sachets - some from Johnnie Water. On my first visit with Johnnie Water, whose real name is John Afele, we headed to his water-packing plant - a spotless room across the street from his sister's home. On each wall are signs explaining rules on cleanliness and hygiene to employees. The water-packing machine itself is about the size of a tall vending machine. It's operated by Edward Dankwah, who showed me how he loads a plastic roll in the back of the device and then sets the metallic sealer's temperature to 140°C. When the machine is on, the plastic sheet runs down the front, is sliced, then filled with water and finally heat-sealed. The brand name "Johnnie Water" is emblazoned across the packets in blue. Afele chose the name as a pun on Johnnie Walker whisky. Bite the corner off one of Afele's plastic packets and you're ready to gulp down some water on the go. A few years after independence, only a sixth of Ghanaians had some sort of access to good drinking water. Today, that number has risen to more than 60%, the latest Demographic and Health survey finds. But Accra's population growth continues to outpace its water supply. In 1911, there were fewer than 20 000 residents. Now, there are more than two million people in the city and more than four million in the metropolitan area, leaving an estimated 30-million-gallon daily water deficit, local news outlet the Graphic Online reports. As recently as the late 1990s, drinking water was sold on the streets of Accra in shared cups scooped out of big aluminium vats. Today, the little plastic packets are more sought-after than bottled water - which is for the rich - and more popular than tap water, which people don't trust. Raymond Mensah Gbetivi, a commercial manager at one of the country's largest sachet producers, Voltic, tells me the 2015 market was probably around 4.5-billion in sales. "People don't trust municipal supply and availability. That's the reason sachets came about." But is all sachet water actually pure? It's difficult to say when the market consists of so many producers. In the past, results weren't encouraging. "It's not necessarily better than tap water," Abena Safoa Osei says. Osei is a microbiologist at the Ghana Standards Authority and lead author of a 2013 study on the quality of sachet water in Accra published in Food Control. Osei's team found various parasites and even a small roundworm in 60 sachets taken from producers. But Osei wouldn't advocate making sachets illegal. "The bottom line is: sachet water needs to be monitored," she says. "You cannot tell me that if I don't have money to buy bottled water that I should buy [lower] quality water." Osei believes tap water is safe to drink - with major caveats. When the water leaves the city's water treatment plants, it is okay to drink, Osei says. 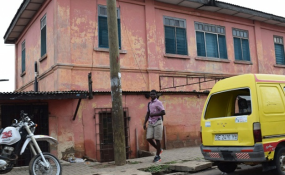 But then it flows through Accra's ageing, broken pipe system where it can come into contact with foul water through leaks and vacuum effects caused by empty pipes, and can be contaminated with disease-causing pathogens. A 2013 study in Science of the Total Environment found that water contamination levels increase almost 60 times between the time it leaves the city's water system to when it meets some of the large storage containers common in many homes. Containers like these were the largest single cause of waterborne disease, mostly because of E coli, the research found. "The booming sachet water industry ... effectively extends improved water coverage deeper into informal settlements ... and alleviates the need in those places for a method of safely storing drinking water," Stoler wrote in 2012 in the Journal of Water, Sanitation and Hygiene for Development. Although several studies have found contaminated sachets, Stoler wrote that very few of them - not excluding Osei's - had too small of a sample size, for instance, to make broad conclusions about quality, even at a local scale. Stoler believes the industry's "warpspeed evolution" has made the product better. Because of the enormous demand, bigger producers such as Voltic are selling the same water bottled for the rich in sachets for the lower and middle classes. And with lots of competition, the customer base is discerning about what they buy. "This is one of those weirder examples of almost pure capitalism," Stoler explains. "You have this gap in supply, so the private sector steps in and fills the demand. Customers start to understand that there's differentiation in product quality. Better-quality producers rise to the top, the market incentives produce better-quality products and - without tons of overregulation - the market has ended up with a pretty good product." A 2014 study focusing on two poorer neighbourhoods of Accra found no faecal contamination in any sachet sample and more than 80% of the samples had bacteria counts below what is internationally allowed - and this was especially true of brands that people perceived to be of high quality. As Osei wrote in a letter to the editor in Food Control: "When the taps run dry, we want measures put in place to ensure that the sachet water that our compatriots are relying on is actually as safe as we imagine it to be."